You need to use a varied array of colourful vegetables to make a good poke bowl, which means you’re guaranteed a healthy meal. The whole family will love my Chickpea, Quinoa & Avocado Poke Bowl Recipe. Heat olive oil in small frypan over medium heat. Add cooked chickpeas, sea salt and smoked paprika. Cook for 10 mins, making sure to stir occasionally, then set aside. Once again, start with components that take up most space in bowls. 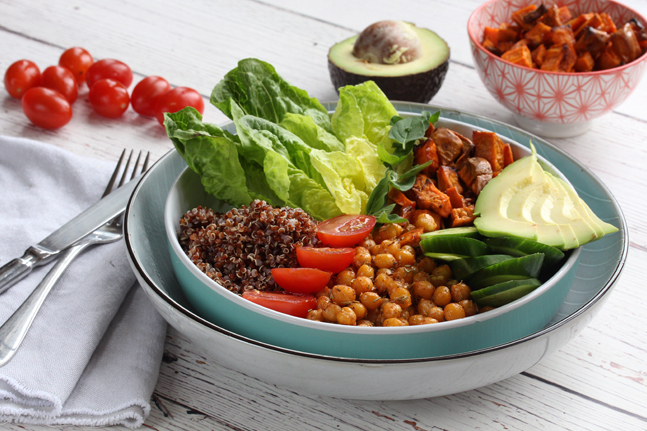 Start with cooked chickpeas, cooked quinoa, cos lettuce leaves and roasted sweet potato, divide between both bowls. 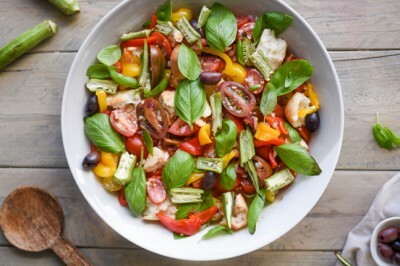 Nestle in remaining ingredients and use to decorate bowls, including cherry tomatoes, cucumber, avocado and fresh herbs.